Japanese tech giant SoftBank is reportedly in talks to back a $6 billion investment in Chinese ride-hailing firm Didi Chuxing, a move that could dilute stakes of existing backers like Apple. Citing sources familiar with the matter, Bloomberg reports Didi is considering whether or not to accept the SoftBank-backed investment as the quickly growing company balances the interests of more than 100 backers. Agreeing to the massive infusion, some six times what Apple put in last year, would naturally dilute the stakes of prior investors. Apple, Chinese social media firm Tencent and other Didi backers are themselves thinking about joining the SoftBank investment on a pro rata basis to retain their standing, the report said. It is unclear if the Didi investment is being led by SoftBank or the SoftBank Vision Fund, the latter being a $100 billion tech fund dedicated to burgeoning industry startups. Though the fund has yet to close, probable initial investments include $45 billion from Saudi Arabia, $25 billion from SoftBank and a number of smaller sums from a variety of tech companies. Apple earlier this year confirmed a $1 billion investment in the Vision Fund. 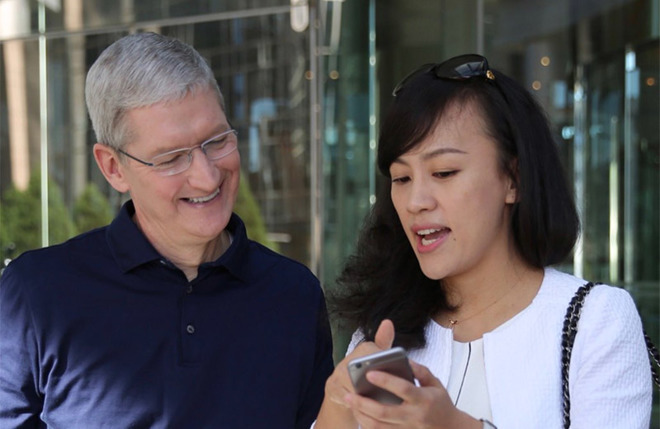 That Apple is said to be considering a stake in the new Didi deal suggests the investment might be led by SoftBank itself. After successfully navigating several investment rounds, Didi is currently valued at some $34 billion, the report said. The firm is using investor money to back ambitious projects around the world, including the purchase of Uber China's assets in last summer. That particular move secured the lucrative Asian market from a move-in by the world's ride-sharing market leader, which was operating at a loss in China to gain a foothold in the region. More recently, Didi joined other ride-sharing services in furthering self-driving car technology, a trend for the industry. Going up against the likes of Uber and Google spinoff Waymo, the Chinese company earlier this month opened an artificial intelligence lab in Mountain View, Calif., near Apple's Cupertino headquarters. Staffed by robotics and AI experts like Charlie Miller, formerly Uber's self-driving team, the lab will focus on the development of intelligent driving systems and AI-based transportation security. Apple is also widely rumored to be working on its own self-driving vehicle in Project Titan, but progress has been hampered by unforeseen roadblocks. While the iPhone maker's autonomous vehicle branch swelled to more than a thousand employees at its peak, a round of layoffs whittled down operations severely. The Project Titan team reportedly has until the end of 2017 to prove it can move forward on its own. Recent reports suggest Apple is turning its focus toward self-driving car software and related platforms. In October, for example, it was reported that the company poached engineers from BlackBerry's QNX to develop augmented reality car navigation systems.